Basa steaks marinated in a medley of spices, wrapped in aluminium foil and baked. Dry roast the cumin seeds, coriander seeds and fennel seeds,and powder it. Grind garlic with a little salt and make it into a paste. Combine spices powders and garlic paste with the dry red chilly paste, turmeric powder, salt, lime juice, hung curd and ghee and mix well. Add chopped corriander leavesnd mix. 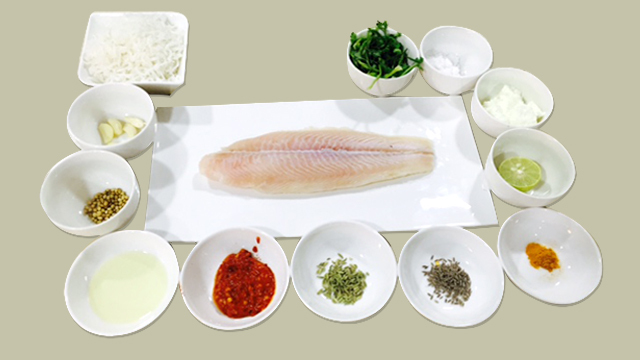 Divide marinade into half and apply to the fillets till they are well coated. 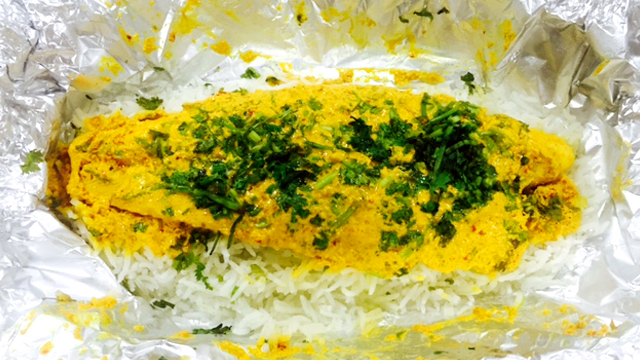 Layer a kitchen foil, make a bed of rice on it, and place the fish on the rice. Close the foil into a parcel so that the steam doesnt go out. Cook the fish in the oven for 30 to 40 minutes.